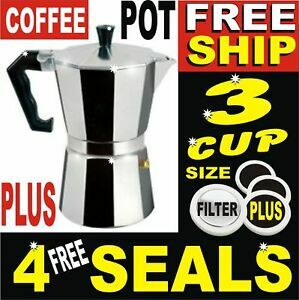 12 Cup Stove Top Espresso Coffee Pot Maker Percolator (#250874104038) View Item. This Aluminum Stovetop Espresso Coffee Maker is the classic solution to making great tasting espresso coffee. Made from cast aluminum, simply use on your cooker or stovetop. FREE SHIPPING (WORLDWIDE) by PRIORITY Air Mail. Includes 1 Coffee Pot plus 4 Rubber SEALS. - If you require insured with tracking please choose 2nd shipping option +$2.99. Thanks!